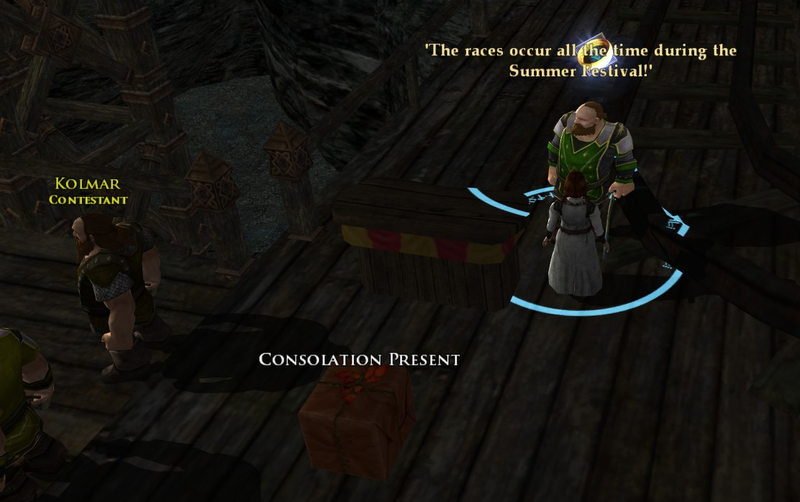 Fetch it, Fish it, Race it… that just about sums up summer festival! Unlike some festivals where tokens flow like water (Farmer’s Faire and Fall Festival), summer tokens are more difficult to obtain. Oh sure, I still got everything I wanted. However, there were no new deeds and I did all the consumables deeds last year, so the only summer goals I had were to get all the new things and let the lildanas play. The “keg race” did not actually launch this year. 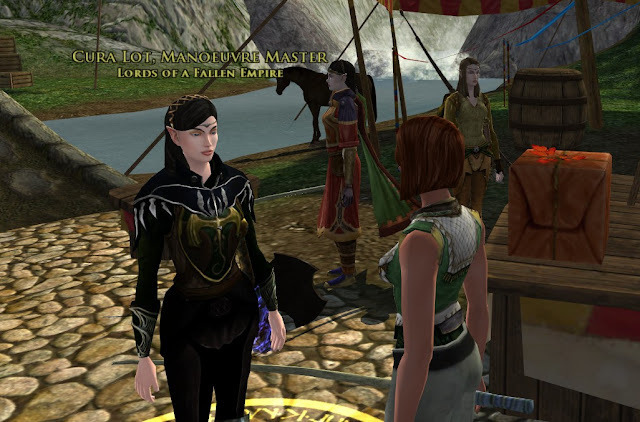 The summer festival is drawing to an end, and the dwarves have yet to make one drinking race. It feels like going to Disneyworld and the Pirate’s of the Caribbean ride is closed for repairs. The thing is, last year, the dwarf keg race and hobbit food race worked great. 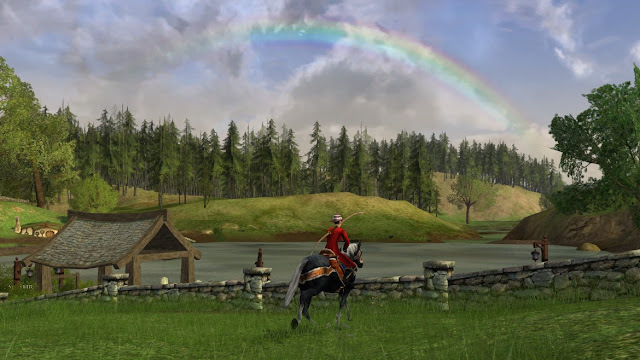 They were non-instanced, in the open environment. I actually liked it much better. Such is progress, and by next year, I will start to forget that it wasn't always instanced and will find ways to enjoy the new version.. assuming that the keg race works by then. I got good feedback on the “scrapbook” style format I used in the past. Since that is one of my favs also, here are a few pictures from Summer festival. Danaszar races toward the Pond in Bywater, ready to do some fishing. The festive Bluepop shoots off some fireworks for the crowd in the hobbit food race. 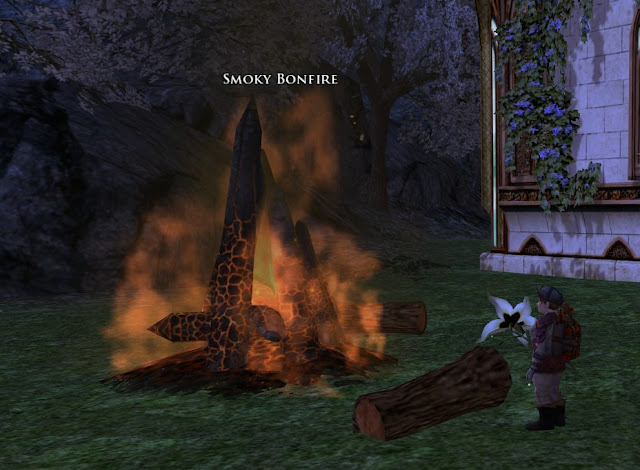 Danaish gets a chuckle out of the “good intentions”, where hobbits were attempting to make a quick path from the Party Tree area to the Taste of Hobbiton. This path did not make it into the summer lineup. 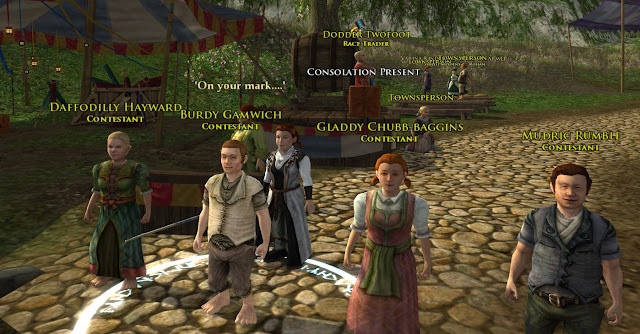 Curalot visits the Taste of Hobbiton to try to guess which hobbit might eat the fastest. 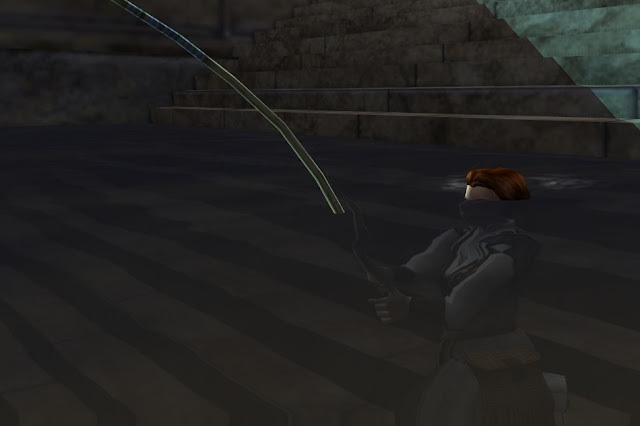 Danaish goes fishing for Amberjacks in Thorin’s Hall. 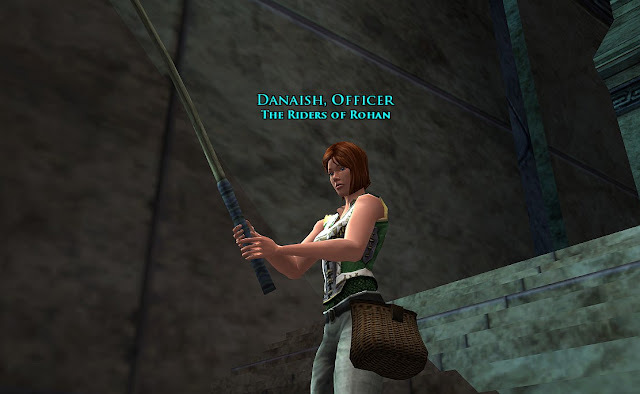 Danadalyn criticizes her technique, explaining that the best way to attract the good catches is to “use your body”... so she immerses herself into her fishing. Danaish remains unconvinced, not wanting slimy things touching her. Dalyn scoffs at Jorfi, the dwarf race trader who says, “The races occur all the time during Summer festival!” Yes, you poor thing… forced to read from the script, knowing full well that no races will occur at all. 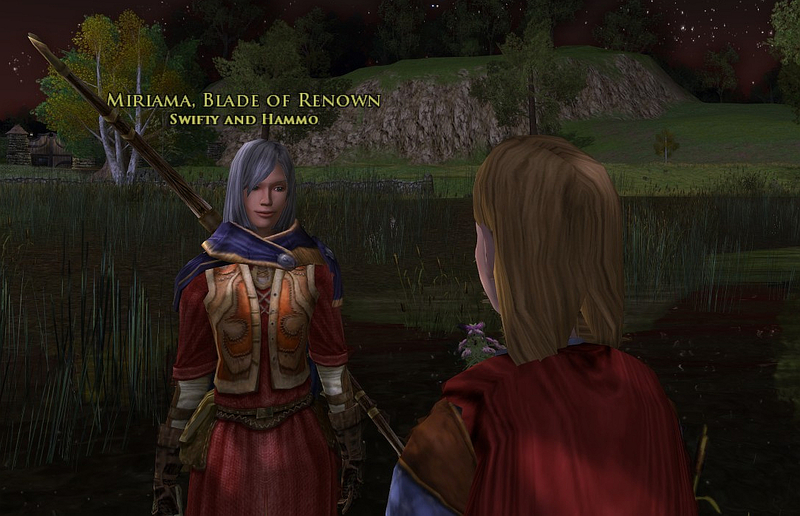 I had the pleasure of meeting the extra nice Miriama who was out fishing one evening. May she catch a good selection of Drums in Chetwood. I was sure to pull out as many of the weeds and goldfish as I possibly could within 20 minutes. With both Farmer’s Faire and this Summer festival, I really have enjoyed the animated barter goodies! Danaonar, Chief Housing Decorator, shows off the selection of the four new animated campfires we brought home from festival. 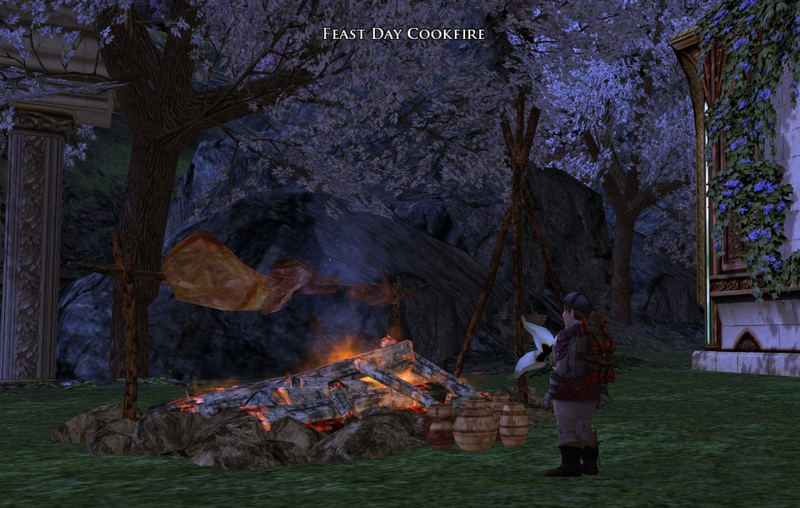 Here is the Feast Day Cook Fire, roasting a nice juicy auroch over the open pit. 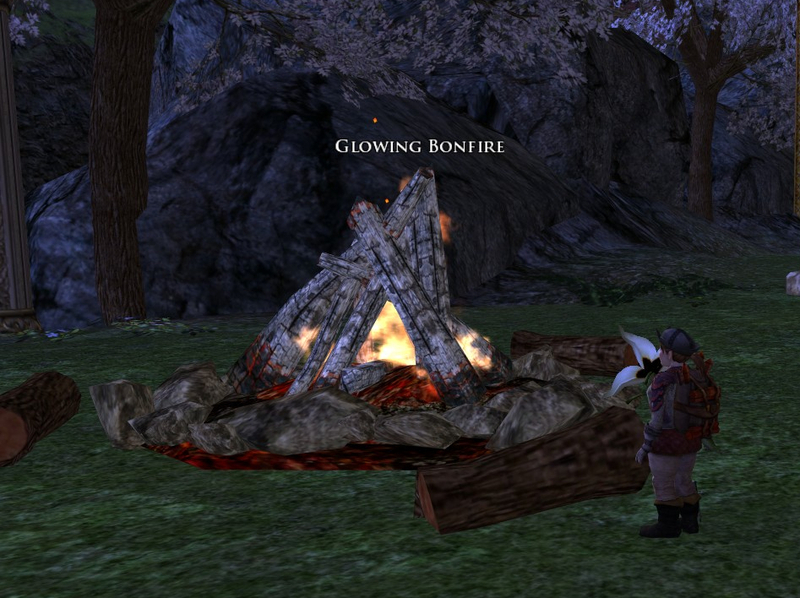 The Glowing Bonfire. Very glowy, perfect for toasting marashmallows for s'mores. 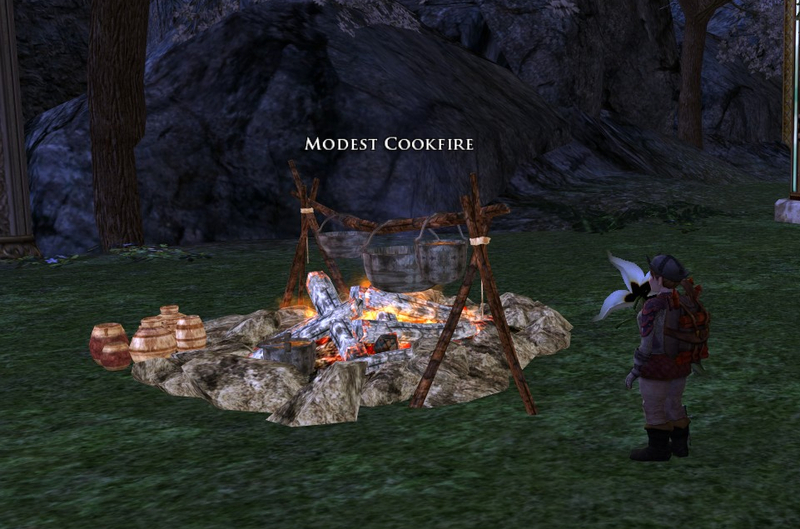 The Modest Cookfire. The hobbits kept burning themselves trying to see what was cooking in the pots. The Smoke Bonfire. That one will be good if sickle flies try to invade Falathlorn. Which fire is your favorite? 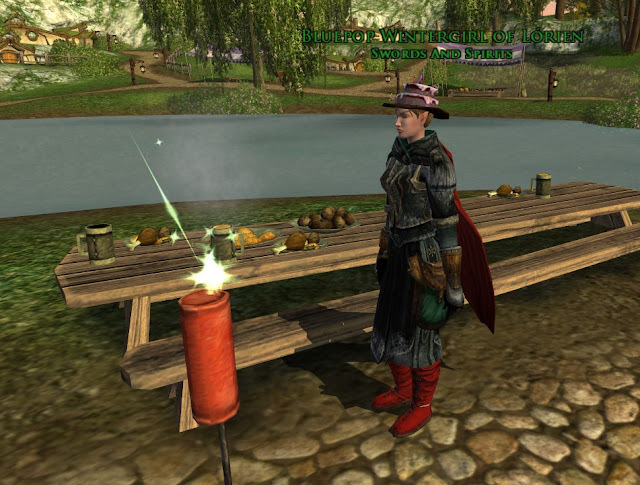 DanaHorn gathered up the newly acquired festival clothes, and with a spark of creativity, she decided to get a jump on Yule postcards. Here is the Summer festival dress and hat, dyed red. Awesome post! I had no idea the festival dress looks so great on a hobbit. You totally inspired me, I need to use one too! Just lacking the time to play right now, and have trouble motivating myself grinding the tokens. Mebbe some kind festivaller will loan you a copy of the pattern (& there is always the AH). 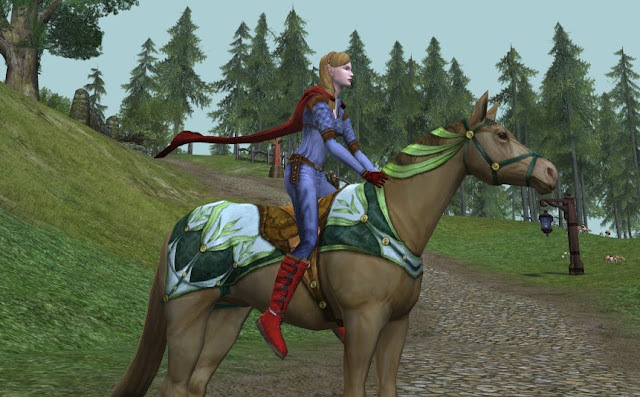 :) Assuming festival isn't extended due to desire to include the broken dwarf races, you still have at least a few days, and the dress only costs 18 tokens. You might have to fish, but that is still less than 1 hour of play. Or... if you have Inn League or AA rep, you could get a pile of tokens (equal to 33+ summer fest tokens for either Inn or AA, or more than 66 for both... in less than one hour). That would be my choice rather than fishing, again. Bonus here, is that you only barter the Drinking Badges you need as summerfest tokens and save the rest for a future festival where you lack tokens and are feeling less than motivated to go and do. Actually, last year's races were both "broken" so to speak. You could wait to see who won, then go to the quest giver and "choose" the winner and auto-win. So, I can see partially why it was needed, as well as working in the festival ticket dynamic and also localizing the force emotes... just too bad is it really, really broke now. Well, yeah. when it is defective in our favor that is a whole different thing. lol! But, being broken-broken doesn't do anyone any good. :) Sadly, the excuses can fill a bucket some days. Here's hoping to brighter days! Would you say that Danaish is squeamish about fish? Well they have those saucer eyes and those trouty mouths... they look creepy. She likes them about like I do... already filleted, grilled, and seasoned.